Imagine if you heard these words from or about your child or family member who has autism, is deaf/blind, has physical and/or mental challenges, is a struggling student or has participated in one of CTR’s specialty workshops to promote learning. Here at CTR, we hear these kinds of sentiments on a regular basis. The work we do changes lives whether for a moment, a day or forever! 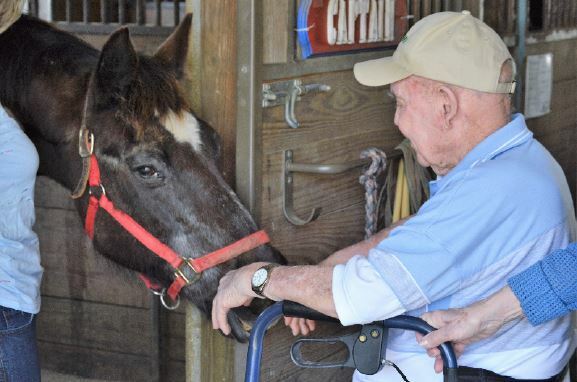 Time and time again, we are told that spending time with our gentle horses, Captain, Foxy, Sally, Tilly, Victor and Buttons, our caring staff, volunteers and other program participants has made an immeasurable difference in a client’s life. In a world where the goal is to find cures, organizations that exist to provide opportunities to those that cannot necessarily be cured are sometimes not seen as compelling. One thing we know for sure is it is certainly more than compelling to see firsthand how our programs enhance the lives of individuals who face challenges of many kinds through equine interactions that foster learning, recreation, and fun. This past year has been one of growth and change – all good! CTR recently earned the status of becoming a Horse Discovery Center, one of 44 in Maryland and the first and only one in Harford County, designated by the Maryland Horse Industry Board to provide farm-based educational programming about horses. We have served over 1,000 people in 2017, through our programs including adapted riding lessons, hippotherapy (physical therapy on horseback) and horse powered learning programs (unmounted activities with horses) both on the farm and out in the community. CTR has been designated an approved field trip site for Harford County Public Schools and we eagerly look forward to many student visits in 2018 and beyond. The biggest news is that CTR has moved to Street, Maryland to a 28-acre equestrian facility, complete with indoor riding arena, 15-stall barn, several pastures, trails and even space for an onsite office. We are currently leasing this facility, but will be purchasing it in 2018 as our forever home! As a result, we will be able to increase the number of programs and enlarge the scope of the programs we offer, meaning we can serve more people with horse-centered programming. It is an exciting time for us! We have a tremendous vision for CTR but we need your help! Help us continue to provide opportunities for learning, recreation and fun by making a donation to CTR today! Your contributions allow us the privilege of serving people of all ages, including the most vulnerable, in a safe and nonjudgmental environment. Please give to CTR as part of our most important annual appeal ever! By doing so you, too, can change lives!